Universal Snorkel Mount Kit Installation This video shows how to install a Blockage Prevention system snorkel mount kit. 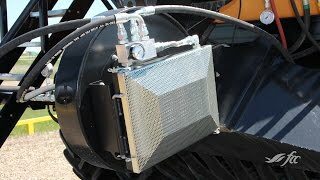 Airguard Blockage Prevention Systems This innovative product helps reduce oil temperature and reduce humidity to help stop plugging of fertilizer on the internal parts of your air seeder. Airguard Seed Brakes Learn about how our seed brakes can help improve your air seeder performance. Airguard Blockage Prevention System Airguard’s Blockage Preventive System reduces airstream humidity, cools hydraulic oil and eliminates plugging, allowing for more efficient seeding. Airguard Blockage Prevention System Reduce plugging with the Airguard Blockage Prevention system. This product heats the air at the intake of your air drill fan to help reduce moisture in the hoses.